Toffee Pecan Banana Bread. Easy to make, but oh so moist & delicious! Toffee Pecan Banana Bread. 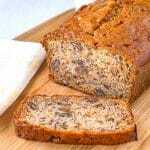 Old fashioned, moist delicious banana bread with the addition of crunchy pecans and toffee chips. Perfect for lunchboxes, coffee breaks or a grab and go breakfast. This Toffee Pecan Banana Bread was Spouse’s idea, once again inspired only by what was on hand. It was a very good idea indeed. Toffee and pecans are natural flavour combination and a very popular one too. 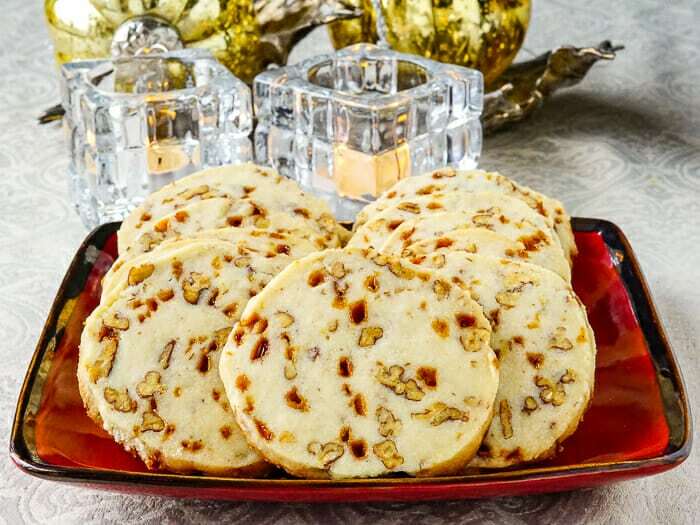 Our Toffee Pecan Shortbread Cookies are always a big hit with our followers around the holidays. Truth be told I really don’t make them much during the rest of the year. My love of shortbread is legendary, so add crunchy pecans and toffee…well let’s just say my restraint goes out the window. I can scarf down a half dozen in no time. 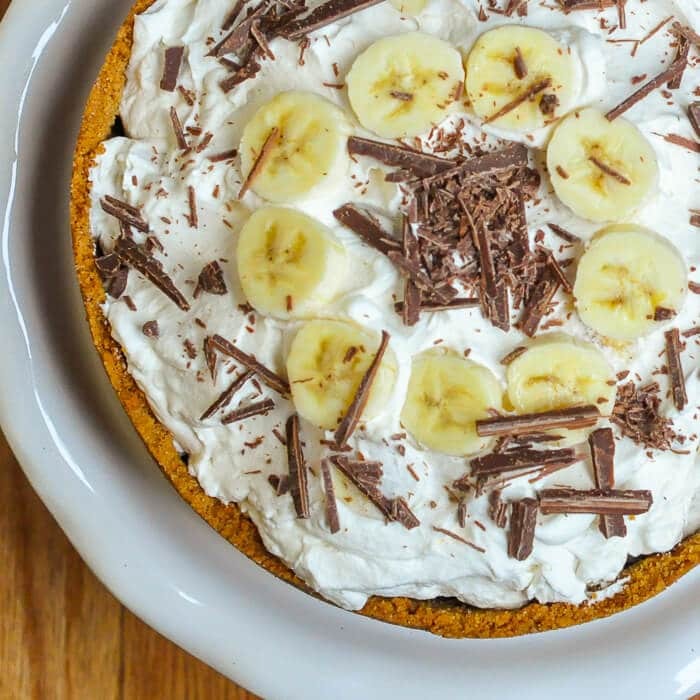 The same goes for banana and toffee as in our legendary Banoffee Pie. That recipe and photo actually won the public vote when I submitted it to the Today Show Home Cook Challenge several years back. The flavour of the bananas, combined with sweet toffee, vanilla whipped cream and a graham crumb crust is just sublime. Everyone who tries it raves about it. 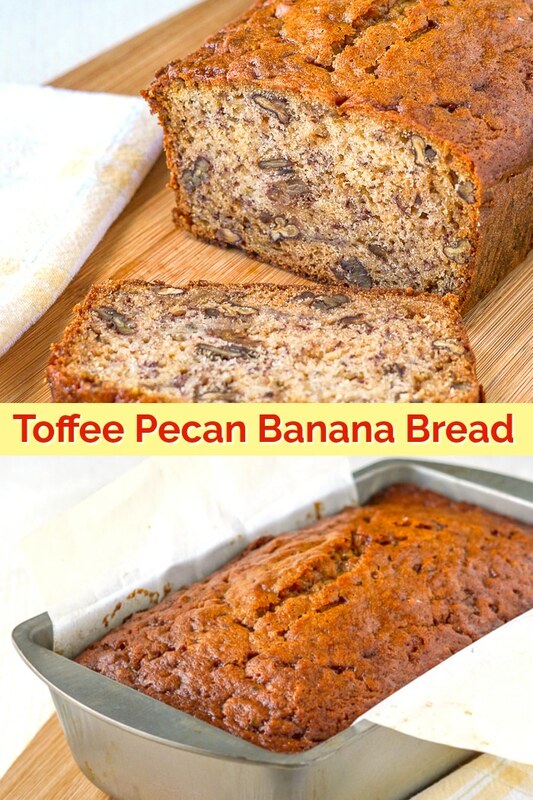 So if toffee and banana go together well and if pecans and banana pair well too, why not see what happen when all three are in the mix. Toffee Pecan Banana Bread, the result and a couple of tips. The result was terrific and of large loaf disappeared in no time. My son Noah loves his banana bread, mostly his Nan’s Old Fashioned Banana Bread and he declared it to be one of the best new versions yet. It would also make a great coffee break treat, is great in lunches or as a grab and go breakfast on the busiest mornings. It’s a recipe that’s well worth a try. A couple of notes on this recipe, first is to be sure to toast the nuts as directed. Untoasted nuts in baked goods are not something I usually suggest. I find they sometimes even soften depending on the type of nut. Toasting helps them keep that great crunch longer and improves their flavour too. There’s just no comparison. 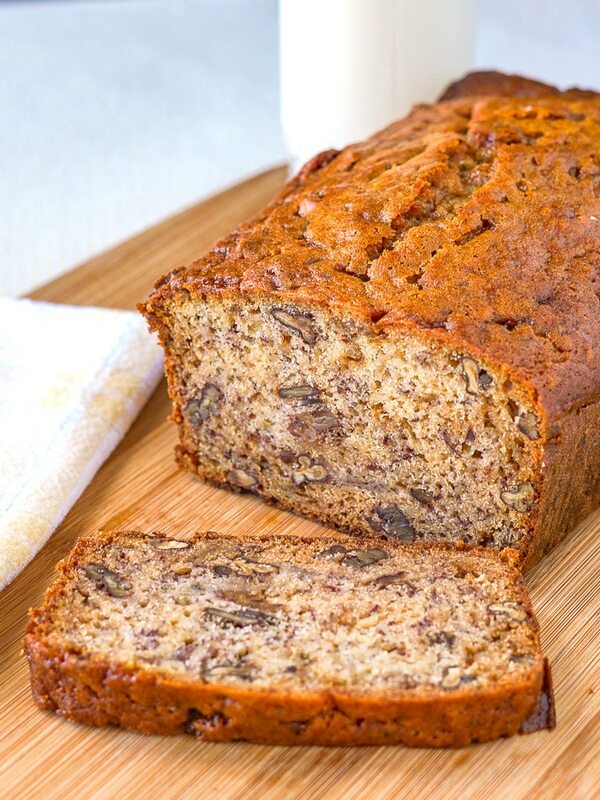 Don’t worry if this banana bread does not bake in one hour in your pans or oven. It will tolerate more time. Just keep checking it and let the toothpick test be your guide. 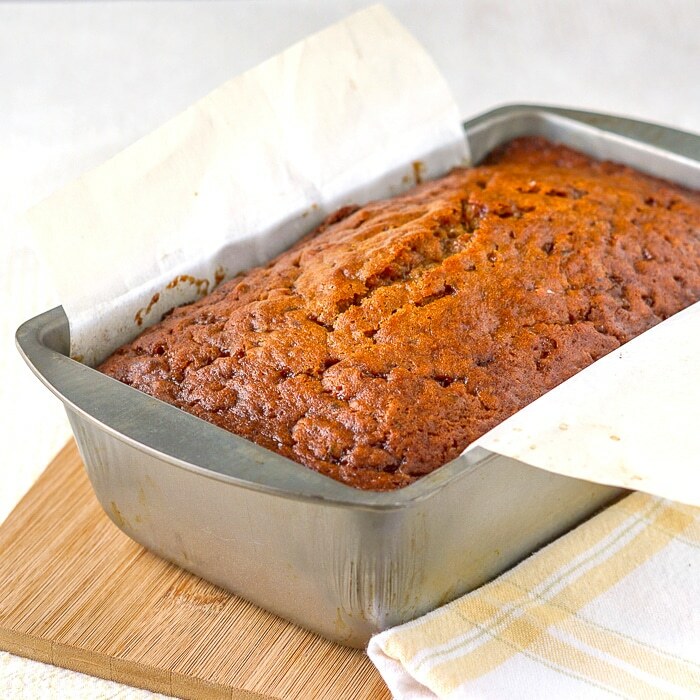 Like this Toffee Pecan Banana Bread recipe? 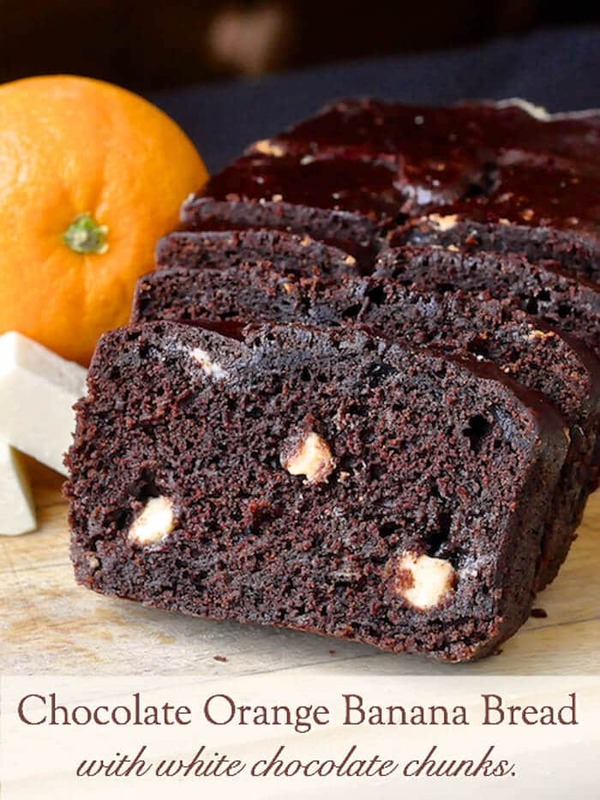 If you liked this recipe, you’ll love our Orange Chocolate Banana Bread with White Chocolate Chunks! Toast the pecans on a cookie sheet for 10 minutes in the preheated oven. Turn them after 5 minutes. Beat sugar and oil in a bowl. Add eggs and mashed banana. Give the cooled pecans aa rough chop with a knife and then fold them into the batter along with the toffee chips. Pour batter into 1 large or two small greased and parchment lined loaf pans. Bake for 45 minutes to an hour depending upon pan size. A toothpick inserted in the centre which comes out clean is the best indicator that the loaf is fully baked. Don't worry if this banana bread does not bake in one hour in your pans or oven. It will tolerate more time. Just keep checking it and let the toothpick test be your guide. I can’t wait to try this recipe. Just like Nan’s old fashion banana bread,it’s a big hit at my house. Just wondering can you bake the banana bread in mini loaf pan,if so is the temperature and time the same. Thanks for your recipes. Your recipes are consistently delicious and I am so proud you are a fellow Canadian.